This IBM® Redpaper™ publication takes you on a journey that surveys cloud computing to answer several fundamental questions about storage cloud technology. What are storage clouds? How can a storage cloud help solve your current and future data storage business requirements? What can IBM do to help you implement a storage cloud solution that addresses these needs? 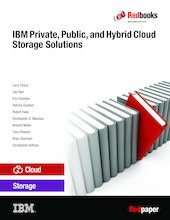 This paper shows how IBM storage clouds use the extensive cloud computing experience, services, proven technologies, and products of IBM to support a smart storage cloud solution designed for your storage optimization efforts. Clients face many common storage challenges and some have variations that make them unique. It describes various successful client storage cloud implementations and the options that are available to meet your current needs and position you to avoid storage issues in the future. IBM Cloud™ Services (IBM Cloud Managed Services® and IBM SoftLayer®) are highlighted as well as the contributions of IBM to OpenStack cloud storage. This paper is intended for anyone who wants to learn about storage clouds and how IBM addresses data storage challenges with smart storage cloud solutions. It is suitable for IBM clients, storage solution integrators, and IBM specialist sales representatives.